I have been watching eBay for the program "Matt Whelan's Compiler Kit". This was a program that converted dBASE IV code to Clipper code. Anyone with any links, or could it be added to the archive? From what I can see on the back of this image, "Matt Whelan's Compiler Kit for dBASE IV" is part of the CA-Clipper 5.3 for DOS Upgrade package. This does not seem to be included on the version here on Winworld. 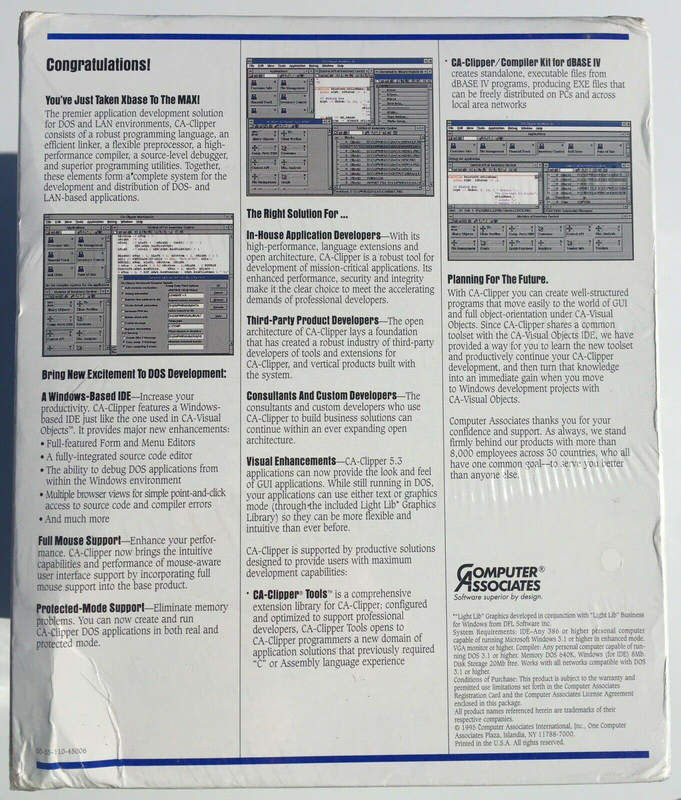 Does anyone have the CA-Clipper 5.3 for DOS Upgrade CD-ROM Version? In other words, the compiler kit (and CA-Tools) are separately sold products, not included in Clipper 5.3 . I could be wrong, of course, but the contents of my Clipper 5.3 package supports my view. P.S. Oops, my mistake, CD version of this upgrade apparently exists. Still, I don't think it contains this kit (and CA-Tools too).